Sean Douglas was physically, emotionally, and verbally abused as a kid. His parents divorced when he was in 1st grade and his Mom remarried an abuser who abused her, his older sister, and himself. He lived in fear until they ran away from him and his Mom divorced. After 9/11, Sean joined the Air Force and has served deployments all over the world. But he had never dealt with childhood trauma properly and used alcohol as a coping mechanism. This led to ruined relationships, bad decisions, and a suicide attempt. He was losing his marriage, children, and military career. To top it all off, his house burned down. In the service, Sean had a great support system and was helped by therapists and chaplains. He became a drill instructor for Air Force Basic Training and unlocked a passion for speaking and training that he never knew existed. From 2009-2013, he was engulfed in personal and professional development, thriving in the environment, becoming a Resilience Trainer teaching Resilience skills. 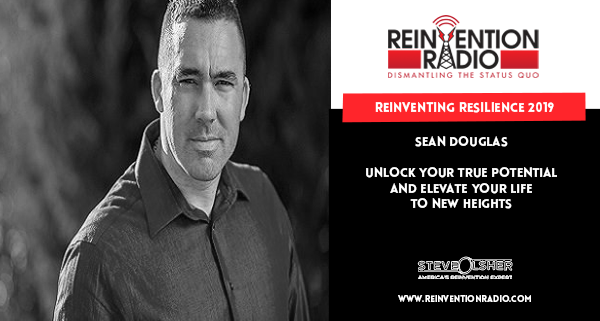 Today, Sean is a TEDx Speaker, Master Resilience Implementer, International Radio Show Host of Life Transformation Radio, Business Positioning Strategist, and Author. His vision is growing The Success Corps to be the premier global Entrepreneurship, Speaker, and Business Owners Academy. Sean offers life transformation skills and business strategies to millennials up to 50-year-old professionals, military veterans, emerging speakers and entrepreneurs that help unlock their true potential and elevate them to new heights in their personal and professional lives. The Success Corps provides people with the tools necessary to live epic lives, and leaves people better equipped to manage change effectively. Tune in to hear Steve, Mary, and Richard chat with Sean about how he helps people unlock their true potential. Reinventing Pop Music – In this episode, tune in to hear Steve, Mary, and Richard chat with Chase Bell about getting what you want from life, without asking anyone permission to be “right”. Thanks for this Very powerful podcast! You’ve shined a light on so many issues that impact so many lives. I have a new understanding and insight into the military mindset/programming and how it impacts resilience and transformation. Also appreciate how Steve and team navigate through a tough conversation with Sean. Thank you, Nancy, for listening and taking the time to comment.